Ark is an innovative new project based in France which aims to unify many different previously incompatible blockchain networks. They fell short of their 2,000 BTC ICO target back in December of 2016, ending up with 1,279.67BTC (worth $998,000 USD, at the time) but decided to proceed with their roadmap while offering optional refunds to investors. The Ark team’s primary objective is to bring the best of blockchain technology to the consuming masses. Rather than a simple investment vehicle like so many altcoins and tokens on the market, Ark aims to create, in their own words, ‘an entire ecosystem of linked chains and a virtual spider web of endless use-cases that make ARK highly flexible, adaptable, and scalable’. The basic idea of Ark is to make blockchain technology more accessible to consumers by providing a bridge for many different blockchain networks to be utilised simultaneously without the tedium of having to be constantly trading in coins to access competing networks such as Bitcoin and Ethereum, the two most widely utilised blockchain networks. 1 Who is Behind it? 2 Why Could this be Big? Ark is the brainchild of some of the key developers behind Berlin-based Lisk, the popular cryptocurrency and independent blockchain network which went live in May of 2016 and has since achieved mainstream success and brand recognition within the cryptocurrency market. A diverse group of talented individuals uniting to realize the vision shared by our 27 members – all passionately devoted to collaboration and the development of the Ark ecosystem. François-Xavier Thoorens, who was a core developer of Lisk and co-founder/CTO of Donat.io, a platform for collecting donations for parishes, is Ark’s head of development and Mike Doty, who has experience in mechanical engineering and helped co-found Crypti, a predecessor of Lisk, is Managing Director. Why Could this be Big? Ark’s main appeal and the reason it could potentially revolutionize the cryptocurrency market and, more specifically, the blockchain technology which underpins it, is its ability to link the various competing blockchain networks together and bridge the gap, so to speak, between them. One of the key attributes of Ark is the speed at which transactions are processed on the blockchain. The website claims Ark’s Core is configured to produce ultra-fast transactions with eight second block times – this is well above what Bitcoin, Ethereum or pretty much any other altcoin on the market can achieve and, as such, gives Ark a strong advantage over many more established coins. Additionally, Ark is highly scalable meaning higher throughput is available whenever ARK needs it so as Ark becomes more popular and more transactions are taking place per second, the infrastructure can still maintain its impressive processing speed. Another innovative feature of Ark is the democratic way in which the project is run. ARK provides a more decentralized voting system than other DPoS (Delegated Proof of Stake) consensus models. Voting weight is divided across all votes instead of assigning 100% weight to each vote, making it nearly impossible for a takeover of the entire network. Accounts vote with their Ark for delegates. The delegates with the most votes (the top 51) are allowed to forge new blocks. Read here about the delegation process and here about the forging process. We think Ark is a very promising project with a strong core team of developers which has the potential to revolutionise the cryptocurrency market. 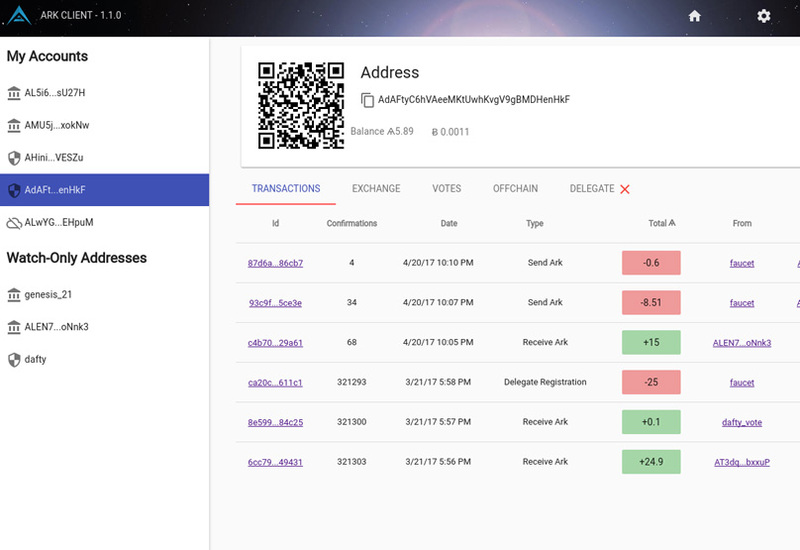 Ark has it’s own official desktop wallet which you can download here. To create your Ark wallet, download the client and click the “Create Account” link a seed consisting of a number of words – copy these down safely somewhere. The client will then ask you type in 3 words from the seed, once that’s done your new wallet will be setup and you will have your address to transfer your Ark tokens to. The Arc ICO ended on December 11, 2016. The sale raised 1,279.67BTC, ($998,000 USD, at the time) which was below the project’s target of 2,000 BTC. After much community deliberation, the team decided to proceed with their roadmap while offering optional refunds to any investors who wanted them. ARK tokens were distributed at the time the genesis block was forged which was earlier this year. If the funding goal was not reached, the plan was to return investments to participants in the form of a full refund. However, as previously mentioned, a decision was made to simply offer investors the option to request a refund; Ark retained most of the funds raised during the ICO. 24 hours after the conclusion of the token exchange, 20% of the funds were released from escrow to the ARK development team. These initial funds were used to pay for corporate formation fees, early developer hiring, the organization of a legal team, and other business related payments. The remaining funds have and will continue to be used to build the ARK network, develop SmartBridge links with other blockchain networks, manufacture Smartcards, and promote ARK services. Ark looks like a fantastic project to get behind. The success of Lisk and Crypti is a testament to the development and management strength of the Ark team. Additionally, Ark has the real power to change the way people buy and trade and build on other blockchain networks which gives it a definite advantage over the countless other altcoins on the market. Indeed, at time of press, Ark’s SmartBridge functionality includes, but is not limited to Bitcoin, Ethereum, and Lisk. Additionally, Ark offers a physical card system, ideal for those who would like to steer clear of traditional bank accounts. And, as for the underlying token, ѦRK coin is fast, secure, and stable, utilizing delegated proof of stake and PBFT (Practical Byzantine Fault Tolerance) to secure the network. At the time of writing ( August 24th 2017) The Ark token is trading at $1.65, we recently ran a poll on Twitter to find people’s predictions for it at the end of the year – the majority thought Ark would reach $5.